The second season of the Meet My World documentary series is premiering on September the 13th at the Union Chapel in London. ​Get an insight of the making of the project HERE. New additions to the Cracker Factory! 3-axis gimbal Ronin-M and our new Lumix GH4 camera which records in 96fps slow-motion and 4K! Now stabilised tracking shots and high res video with increased detail are available for our clients. Don't forget to give us a shout to get a quote. Thanks to the organisation Discovering Latin America, Meet My World was showcased once again on the big screen at the Odeon Covent Garden Cinema in the heart of London. The screening was followed by appearances from Fred Branson and Chris Palfreyman from Amantani UK, Martin Morales from Andina, and a Q&A with Cristina about the making of our 14 documentary films in 3 weeks at 4,000 metres above sea level! It was a lovely night and a great opportunity for those who haven't seen them in the cinema before, and it was certainly very interesting to have the chance to chat with quite a few Peruvians who came to the screening, and listen to their emotional reactions to the films and fond memories from their own childhoods. We would like to thank Veronica Saenz for sharing these photos with us! Thanks to Lucuma Films in New York City, Cristina was commissioned a documentary shoot in Ancash, Peru. Alongside Director Mitchell Teplitsky, Camera Palu Abadía and Soundman Javier Arciniega, Cristina filmed the provincial elections in a remote town called Llamellín, 8 hours away from the city of Huaraz. The crew spent 3 weeks filming the everyday life in Llamellin surrounded by amazingly beautiful landscapes and the election process for mayor of the province Antonio Raimondi during late September, early October 2014. Here is a little taster of shooting 15 films in 3 weeks at 4,000 metres above sea level. It is full of outtakes, smiles and insights on the process of making the Meet My World documentaries with Amantani UK. Thank you Amantani UK and Andina London for letting me be part of such a beautiful project. Now just grab a drink, take a seat and enjoy! 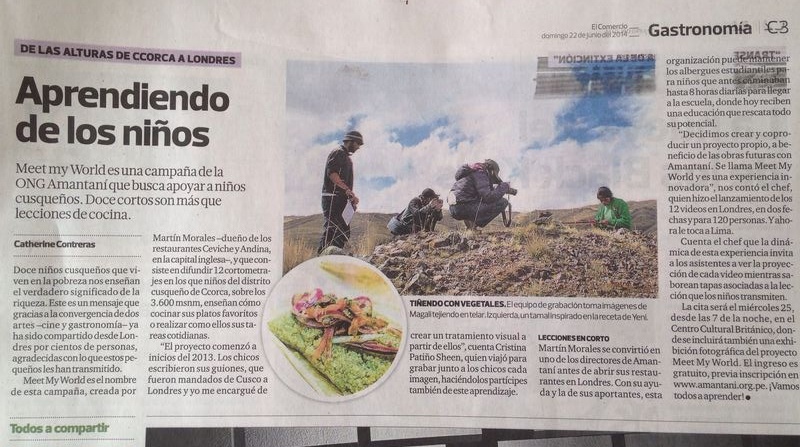 Meet My World and Cristina's work were featured in the Sunday's issue of the national newspaper El Comercio (22/0614). The films will be screened on the 25/06 at the Centro Cultural Británico in Miraflores, and after that is going to Cusco for a very special screening for our 12 amazing teachers and all the community of Ccorca! After 18 months of hard work, our Meet My World documentaries were finally launched on May 6th and 7th at the Millbank Media Center in London. Both dates were SOLD OUT. 600 people went to see our beautiful films on the big screen. A new slider has arrived! We decided to make a good use of good Friday and make a little test with our brand new slider Konova K2. It's smooth and it has a lot of potential. If you want your films to have a funky slide and high-end edge, you know where to find us! Cristina has been commissioned by Amantani UK, a charity working to defend the rights of children in Peru, to shoot a series of films starred by 12 children teaching something they love about their community. Do you fancy learning catching fish with your bear hands, dying wool with vegetables, shepherding sheep, making delicious Andean meals, making Inca bread, healing with medicinal plants and much more? Then stay tuned! The films are in the making and they will be screened in London soon! 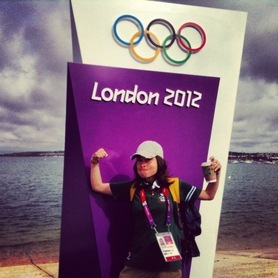 In the meantime why don't you find out how is Cris doing up in the mountains of Peru in her blog! London at the end of 2012 Olympic and Paralympic Games through the eyes of 3 new Londoners (former Lima, Kansas and Bournemouth). Shot on 25fps and 50fps on Canon 60D on August 2012. In 2008 Cristina won the contest created by Sony Music BMG Argentina and Gustavo Cerati, one of the most widely acclaimed musicians in Latin America. The prize was having her videoclip with "Dir: Cristina Patiño Sheen" written along the bottom included in the final master of the music video of Cerati’s song “Lago en el Cielo” from his album Ahí Vamos. It was showcased in MTV Latin America and many other international music channels. Don't miss out minute 0:51!